Package Content: 1 pc magic props Product Material: Plastic Product Weight:15g Product Color: Random Product Specifications:3.9*4.5inch Product Usage: Rebirth of butterfly Tear up the paper painted with butterfly then restore it,which makes butterfly fly from the paper. Transformation from empty hands Put a caterpillar (larvae) butterfly in your hand, and make it a flying butterfly. Freedom butterfly Butterflies appear from a cash. Vigour pageButterflies appear from a book. Artwork of butterflyButterflies flies from a silk. Magic case Butterflies flies from a case. Flying card A chosen card will be showed by flying butterfly. 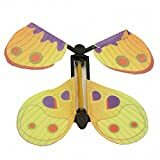 This entry was posted in Discount Childrens Toys and tagged AOHANG, Butterfly, Cocoon, Flying, into, Magic, Magician, Transform, Trick by Childrens Toys and Games. Bookmark the permalink.